I was recently asked to try out some rather cool looking chalk paint from an equally cool named company called Vintage Rocks. As I have an event coming up in July where I will be selling stock from my website, painted furniture etc all with a seaside blue and white theme, I decided on the beautiful Lagoon blue and the Whiteout white (of course). I had an old pair of oars in my shed just waiting for some reloving. Perfect to try out the chalk paint. 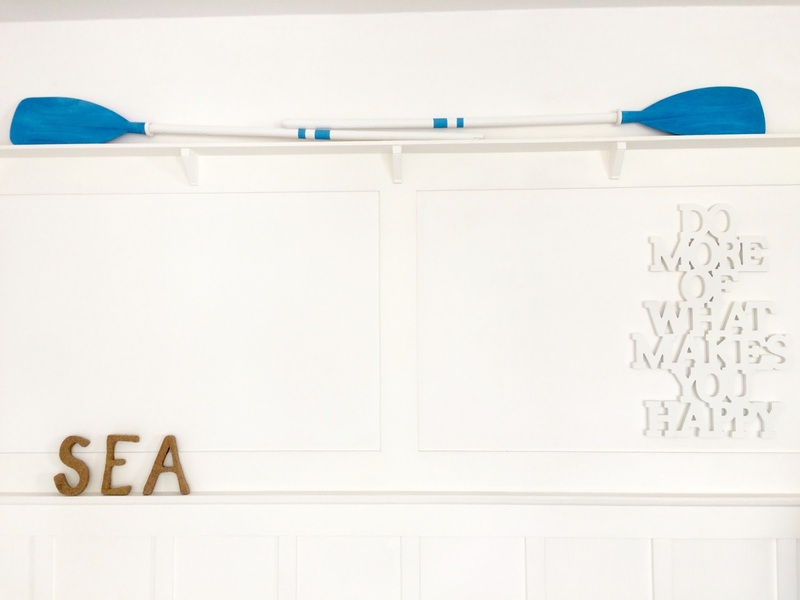 Chalk paint has been developed to cover just about anything from fabric (yes you can paint fabric) to metal, so I thought I’d give it a go on the wood and plastic oars. I found these old oars in a local charity shop. Not in great condition but perfect to give a new lease of life with a lick of paint. They would only really be good to display after painting, probably best not to use them as actual oars ! Lots of scratches and marks. Time to give them a quick clean . Give the handles a quick rub down with a lightweight sandpaper. I decided to paint the paddle with the Lagoon blue and the handles with the whiteout. After cleaning the oars I also rubbed down the paddle with a light sandpaper, this removes any little imperfections or oily residue and helps the paint to stick to the plastic. The colour is beautiful and covers really well. It is clearly a good quality paint. Don’t think I will need many coats of paint to make a good job. Couple of minutes later and this is the paddle after one coat. Not bad a t all. after painting both paddles with one coat and leaving them to dry, I started on the handles with the whiteout. Again it was quick and easy to cover and the first coat gave really good coverage. Decided to add a few stripes on the handles. I’m not very good at this as its hard to get the tape in exactly the right place. Its usually a job hubby does but as he is at work and I am an impatient kind of person I had a go. Many thanks to Vintage Rocks for the sample pots. More than enough to paint the oars and still half a pot in each left for another little project. Fab job Karen, I would never have thought to paint plastic with chalk paint (but then I've never used chalk paint, can you believe it!). 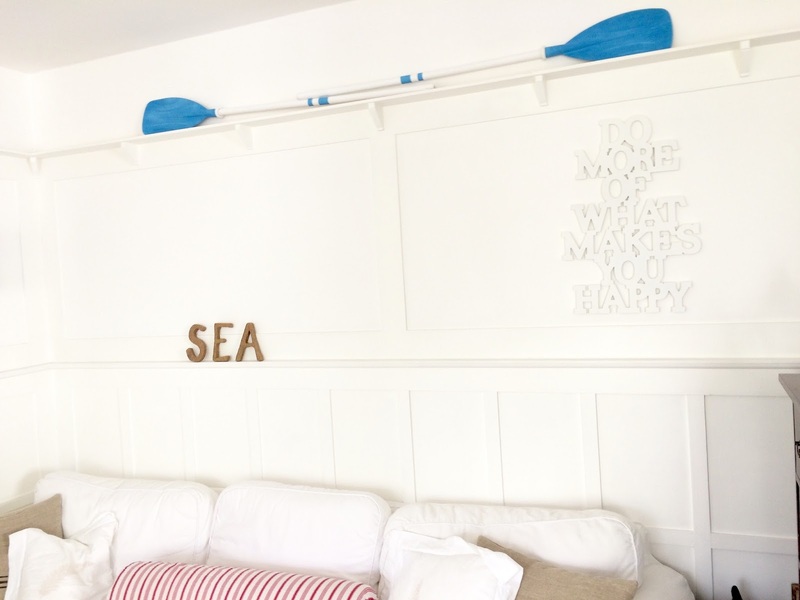 They look great on that shelf above your sofa, a lovely seaside-y look. Best of luck with the event in July. Really impressed with the paint. its not nearly as thick and uncooperative as some chalk paints I could mention. I've never used chalk paint either and had no idea it was so versatile. Love what you've done with the oars, they look much better. That is one cool and sassy looking paint brand. What a difference a coat of paint makes – and they look fab perched up on that shelf!